I looked at RangeAccumulator (4.6.0) and I see that indeed it scans through all the ranges (I thought it breaks on the first matching range). So while it indeed supports overlapping ranges, I wonder if the accumulator was specialized to non-overlapping ranges, and breaking after the first range that matches, if we gained anything? This is also true for the interval tree right? You won't need to rollup in the end? We could specialize and break after the first one ... I think how much that would gain would depend on the data, i.e. how often do the "early" ranges match vs later ones. For use cases like Updated, the vast majority of hits don't match any ranges. I'm not sure that a similar "count only elementary intervals and rollup in the end" approach can work with interval trees? They seem to require that you count every matching interval for each point you look up? I suspect the simple binary search + rollup in the end should perform best, and doesn't need to be specialized for the overlapped / non-overlapped cases. Essentially, that nice optimization reduces the overlapping case back to a non-overlapped case (plus the rollup in the end to reconstitute the "original" ranges). A very inspiring article, Michael! Thank you for your time and sharing. 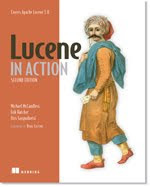 I'm on the process of learning Lucene as part of getting to know the tools of my trade, and I find it fascinating, the endless possibilities and applications of the technology. Articles like the one you wrote shows a glimpse of the amazing things that can be built for enterprise software, beyond the usual and boring (after a while) Spring/JEE Stack. Thank you :) Apache Lucene is a fun project! Hello Michael. I am starting to use Lucene more frequently in the projects. As my use case varies from 1 point to another, I am exploring more and more of Lucene. As such, I am finding it more fascinating and have started developing a strong affinity for Lucene. I might sound ambitious but nonetheless, as I said, Lucene seems to be very interesting and very addictive. You can just poke around the source code you checked out, you could have a look at the many open Jira issues (bugs & new features & wishes, etc. ), here: http://jirasearch.mikemccandless.com Find something simple/small to fix first and post a patch. And subscribe to the dev list (send any email to dev-subscribe@lucene.apache.org) and see what's being discussed. newbie to solr, is it possible to get autocomplete from field:content through terms or suggest or facet by date range. I need a autocomplete for a word by date range. Could you ask this question on Solr's users list? (solr-user@lucene.apache.org). I'm less familiar with Solr.